On Wednesday, lady parts grievance-monger and full-time Obama cheerleader Sandra Fluke brought her rah-rah-victimhood routine to the University of Florida. #FiredUp crowd of #GatorsforObama @ @UFlorida. 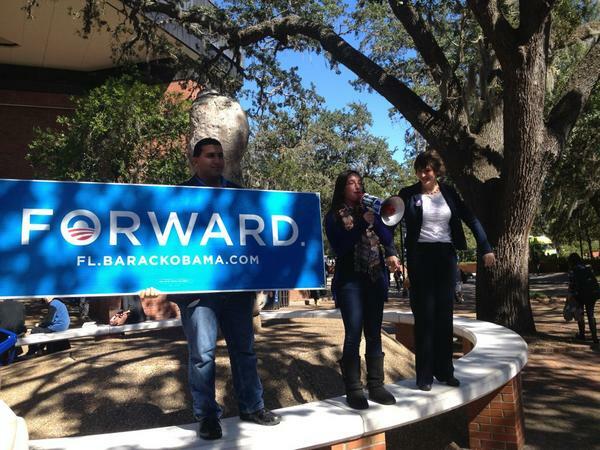 they get how important it is that #students #gotv in #florida for #Obama2012. A “crowd”? Oh, honey, can’t the Obama campaign spring for a dictionary along with your birth control? Fluke whipped out her Obama for America pom-poms in front of a “crowd” that reportedly numbered in the TENs. Moving on up! Just last month, Fluke fired up an enthusiastic gathering of just ten people at the Sack ‘N Save in Reno, Nevada. So, with crowds like these, Sandra Fluke will be on the bar mitzvah/wedding circuit soon right? Fluke stopped at UF as part of her “It’s On You” Youth Early Vote Campus Outreach tour. About 40 students gathered by the potato statue to listen. Jammie Wearing Fools caught this tweet which captures just how humiliating the turnout was for the woman Dennis Miller dubbed Moan of Arc. Oh, goodness! The turnout was so great, they might have to grab a second van. Forward!